Made in Melbourne Australia by Dynamo House. The Nostradamus Oracle, 36 magic picture cards. What a cute kit. There is a large fold out instructions sheet that is printed on thick card stock – oh so convenient. The great thing about the deck is it’s size. 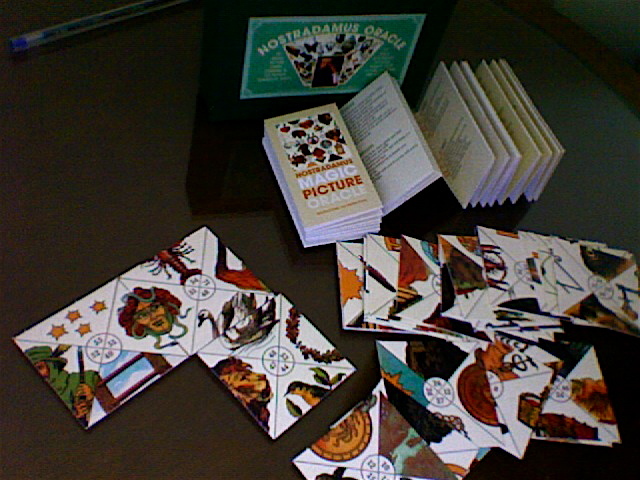 At first I was surprised at how small it was, but when you lay out all the 36 cards for the reading, it does not take up so much space as the Svetlana Touchkoff’s Russian Gypsy Fortune Telling cards (which I got for my birthday in the 1990’s). Touchkoff’s layout is identical to the Nostradumus layout, as are most of these types of 4 part image per cards are. It will be interesting to see what the Nostradumus oracle predicts. I am still trying to locate the Nostradmus magic picture oracle but I have had no luck. I checked the location mentioned but they said it did not belong to them.Does anyone have any information about how I can get it, the ISB number? It is called Nostradamus magic picture oracle right?